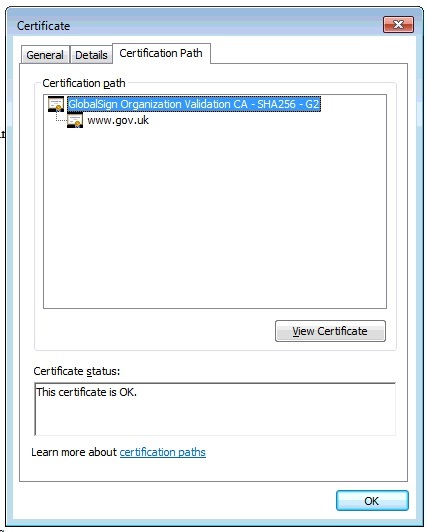 Note that I am accessing gov.uk - so there is no way this is an issue with the web server (I can connect to it fine elsewhere). On the Domain Controller (running Windows Server 2012R2) - the page loads fine. I have checked the time/date on the client machines, they are OK. I have tried installing the certificates, which says "Import Successful" but makes no difference in the end. I went on the Domain Controller that was able to access the site, and I exported the GlobalSign root cert shown in Yo Mama's screenshot. 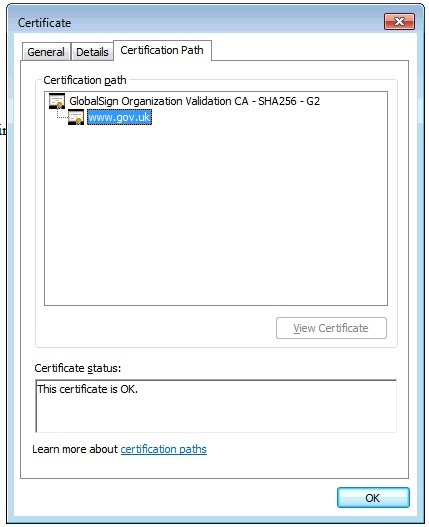 I placed it on a network share and then imported this cert into the third party root store inside of the Certificates console from MMC on a test machine on the network. This solved the problem; also it's kind of a pain - I'll review the updates as well but for now, exporting the cert from a working machine and importing it on the erroring ones fixes it. I'll see if I can try that as a workaround. This is coming up within the network, desktop machines that have had no drop-outs. One thing I suspect is that there are missing Windows Updates as I see a lot on WSUS that haven't gone through and the machines still being IE 10, I question it a bit more. If that workaround will at least make the page 'work', I'll check if I can do that today, and rollout Windows Updates throughout the week(s) and test until hopefully one them makes the certificates work. 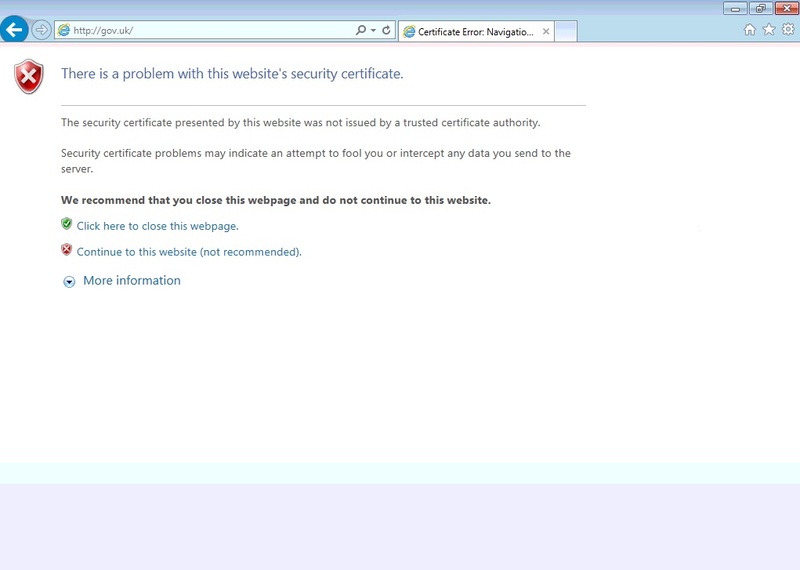 Yes, it should do that - although even if I explicitly go to https://gov.uk - I still get the same error page. In addition, you could also refer to this article and check if it helps. I have tried those, nothing has worked so far. 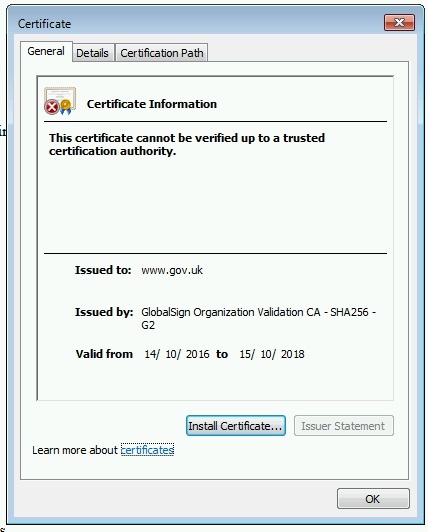 I have unchecked "Warn about certificate address mismatch", I have installed the certificates, I have ran as administrator, I checked the time/date to be correct, I have done a reset of IE and cleared SSL cache. I still get this certificate error, I've really ran out of ideas.